Several months ago I reviewed the short story The Frozen Sky, by Jeff Carlson. I loved it, and in an email to the author called it”a hard science-fiction that’s worthy of Isaac Asimov or Arthur C. Clarke. Recently, Jeff has published an expanded version of the story with the same name as a novel. Here’s my take. The novel is composed of roughly three sections. 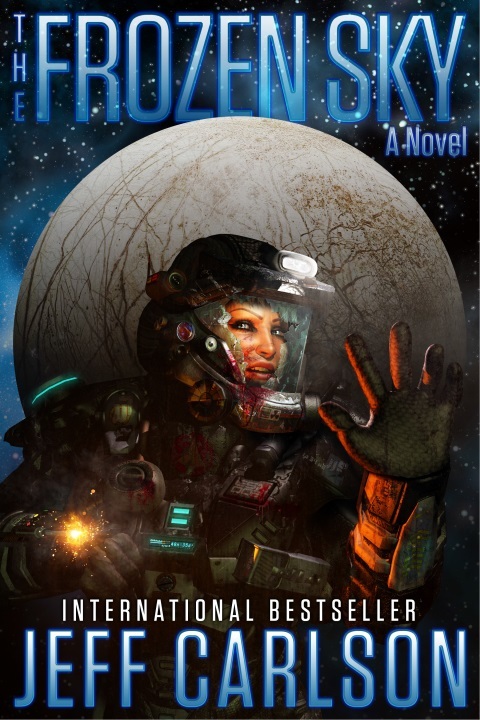 The first is largely identical to the short story, a description of a critically wounded astronaut attempting to escape from aliens on the moon Europa. 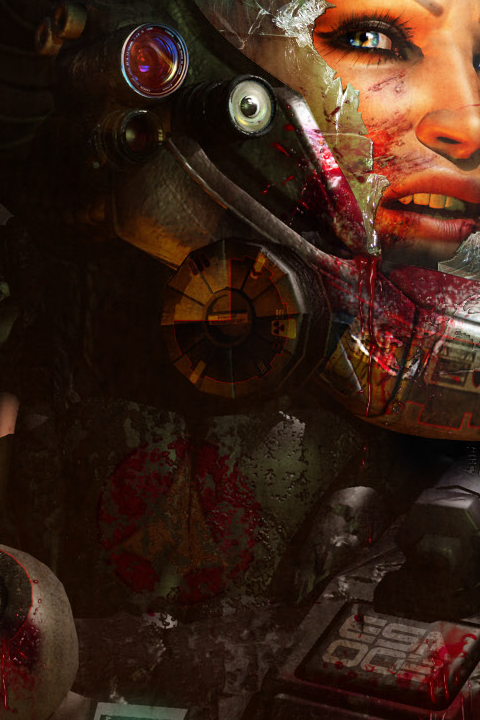 Jeff’s original contribution is to have a narrator so badly damaged — blind, crippled, and bleeding — but possessing a space suit capable of both locomotion and artificial intelligence. The suit’s ability to “auto-attack” is placed aside the seemingly unthinking, untalking, and uncaring aliens — called starfish — who likewise appear to be incapable of sight, intelligence, or warmth, and whose reaction to the wounded astronaut is auto-attack. This section survives intact in the novel. As in the short story, it is amazing. The second section is an extended description of politics between the European Space Agency, the Brazilian Space Agency, scientists on the moon Europe, and various others. This is by far the weakest section of the novel, and the long time it took me to finish the novel was due almost entirely to this portion. As I told Jeff during my reading of the book, if I had been involved with the meetings that had gone into launching such a complex mission to an alien moon, I’d be willing to just nuke the starfish and get on with the original objectives. I wasn’t being entirely facetious. I work in corporate research & development, where my discovery of new things works hand-in-hand with furthering practical objectives. I am responsible for two major research efforts, and am familiar with the amount of “political?” work it takes to get many people with many different interests in agreement with a research direction. But the actions and thoughts of the characters in The Frozen Sky during this section did not appear realistic to me. Itâ€™s my humble opinion that many people are stupid, inconsiderate, unimaginative, delusional, self-centered, greedy, or cruel. Heck, a lot of the time theyâ€™re some combination of all of the above. I think human motivation is more complex and ambiguous than this. So it was more difficult for me to understand the actions of the characters than of the starfish, or of the AIs. The last section of The Frozen Sky is a return to form. The last portion is the story of the ESA’s attempt to communicate with a group of starfish, which involves empathy with an alien intelligence. Basic assumptions — but not obvious ones — are shown to be incorrect, and the writing’s fast pace caries the reader along. The weakness of the middle section of The Frozen Sky keeps me from being able to recommend the book. I loved the short story (read the review and buy it), and the last portion is enjoyable. Indeed, the last section could easily make a great short story, whether or not the author kept the same characters from early on. But my unusual position of being an applied researcher meant that passages that involved corporate politics did not have verisimilitude, and so hard to be trudged through. On his blog, Jeff has an awesome collection of photos of the Jovian system, with captions and explanations. I read The Frozen Sky in the Nook edition. 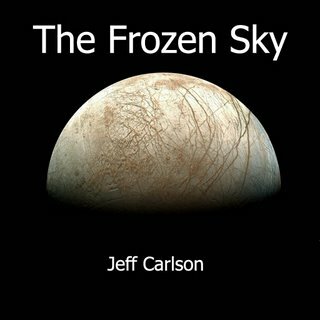 Recently I conducted an interview with Jeff Carlson, author of The Frozen Sky. In the first part of the interview I asked Jeff about the writing process, communication, and alien personalities, but I saved the question I cared the most about (the motivation of applied researchers) to the second half. As an applied researcher — someone who who leverages scientific methods and findings to practical ends — the behavior of the European team, both which each other and others, on the frozen moon Europe was fascinating. Q: What motivates the human characters in the novel? Does this reflect your view of human motivation in general? A: Unfortunately, yes. Itâ€™s my humble opinion that many people are stupid, inconsiderate, unimaginative, delusional, self-centered, greedy, or cruel. Heck, a lot of the time theyâ€™re some combination of all of the above. The great news is humanity is also peppered with heroes and geniuses and big-hearted people who are proactive and caring and good. I’ve previously written that even scientists are driven by power, influence, and money. But my difference with Jeff — which I think lead to some dissonance while reading The Frozen Sky — is his relative optimism about humanity. If humans really were divded between “stupid inconsiderate, unimaginative, delusional, self-centered, greedy, or cruel” people on one hand, and “heroes and geniuses and big-hearted people who are proactive and caring and good” — we would be a lot better of: just get rid of the mean folks, and everyone will work hard and get along! Rather, humans are stuck in a situation where we are most successful when we do something that we’re great at, we enjoy, and we make money at. There is every incentive in the world to take the perspective of your profession — if you’re really want to enjoy your work, it should be something you are good at, and something that is profitable to you. But this also means there is every incentive to be blind to the world, if sight would rob you of effectiveness, or joy, or the ability to make money. Q: Would you want to visit Europa? A: Iâ€™m there right now, my friend. The worlds beneath the ice were too big not to go back, and Vonâ€™s crew barely scratched the surface after meeting the sunfish clans. What about deeper into the ice? What about the ocean further down? Stay tuned, for my review of The Frozen Sky. Two years ago I reviewed The Frozen Sky, a novella by Jeff Carlson. Jeff’s now released the novelization, which I have read, but before I post a review I want to share an interview and discussion I had with Jeff. This is in two parts. Q: The Frozen Sky was a breathtaking novella. What was the path from that to writing the novel? Did you always haveÂ the rest of the story in mind?Â Was it an independent creation or something else? A: Thank you!Â Transforming the original story into a full-length adventure was always a book I wanted to write.Â Letâ€™s face it.Â Itâ€™s a really cool idea.Â In fact, The Frozen Sky: The Novel was my first pitch to my editors at Ace/Penguin as a follow-up to Plague Year. There arenâ€™t many similarities between the two concepts except that both books are about bizarre environments, and Iâ€™m fascinated by how our worlds shape us.Â Plague Year deals with scattered human survivors above 10,000 feet across the Earth.Â The Frozen Sky features a bizarre alien race living in vertical catacombs inside Europaâ€™s icy crust.Â But Plague Year is a present-day apocalyptic thriller and The Frozen Sky is straight-out sci fi, a near-future â€œaliens vs. battle suitsâ€ adventure with artificial intelligence, genetics, cyber warfare and gun-toting mecha set against the spectacular panorama of Jupiter and its moons. My editors and the marketing team at Penguin already had me branded as a contemporary thriller writer.Â And they were right.Â I ended up writing Plague War and Zone, a career decision that worked out well for everyone involved.Â Writing the rest of the Plague Year trilogy was a LOT of fun.Â I love blowing things up! !Â Aha ha ha.Â But in the back of my mind, I was always developing the alien worlds beneath the ice. Q: The theme of communication is very strong in the novel The Frozen Sky. When you were writing it, did you have other works in mind? Where there any fiction or non-fiction sources that served as inspiration for how communication is treated in The Frozen Sky? A:Â Well, letâ€™s not pretend I havenâ€™t read classics like The Mote In Godâ€™s Eye or Double Star or The Forever War twenty times each.Â Absolutely I had inspiration.Â Thatâ€™s the mystique of science fiction — big new ideas, haunting scenarios, and smart people in bad situations.Â Even hoary old movie adaptation of stories like Enemy Mine resonated strongly with me as a boy. Q: There are AI personalities that are (or at least seem to be) self-aware in both the original novella and the book-length version of The Frozen Sky…Â How did you intend for us to see those AI?Â As humans? Aliens? Computers? Something else? A:Â I like your second suggestion best.Â Yes, in many ways the artificial intelligences in The Frozen Sky arenâ€™t human, are they?Â Not even the human-based AIs . Â They canâ€™t be. A super-computer artificial intelligence processes information so quickly, itâ€™s inhuman.Â Or in the case of AIs corrupted by suit malfunctions or electronic warfare, theyâ€™re insane and untrustworthy. 1) Could you describe “The Frozen Sky” in your own words? But I like to think thereâ€™s more going on. Iâ€™m fascinated by environment and how our surroundings affect us. Yes, â€œThe Frozen Skyâ€ is a sci fi action-adventure story. There are freaky little intelligent starfish that hunt in packs, and people get their faces ripped off in a dark, spooky world, and yet the underlying theme is Why are we what we are? When and if humankind makes contact with extraterrestrial life, I personally bet against discovering that the galaxy has evolved on the Star Trek/Wars model, i.e., everyone else also will be bipedal air-breathers. There are going to be some weird, scary aliens, dude. So I imagined we found â€˜em nearby on one of Jupiterâ€™s moons. 2) The Frozen Sky strikes me as a story of conflict, with the principals being by turns profoundly disabled and profoundly disturbed. Is this a fair description? Aha ha. Youâ€™re only being half fair! The main focus is Alexis Vonderach, a human explorer in over her head. We see the story through her eyes, and my hope is everyone will agree Vonnie is a bright, capable, tough-minded hero who remains as grounded as possible in horrific circumstances. But if youâ€™re talking about her opponents, yes. By our perspective, the lifeforms deep inside the ice of Europa are savage, stunted nightmares, blind to many fundamental human traits like curiosity or fear. And yet their reactions arenâ€™t only sensible. In their ecology, violence and greed are survival mechanisms. My guess is most people capable of such proficiency are either highly trained or highly intuitive. In a crisis, they donâ€™t use their conscious mind. They go on instinct. And yet our strength as a species is our ability to evaluate, study and outwit threats and obstacles. Sometimes that works against us. Physiologically, human beings are virtually identical all over the world, and yet we couldnâ€™t be more diverse. Why? Our perceptions and beliefs, our very senses, are shaped by where and how we live. Maybe that seems obvious, but especially in politics and religion, I hear people speak as though their subjective ideas are absolutes. In reality, each of us is extremely small and we comprehend only a fraction of the influences on our personalities and our decisions. Too much of the time, we operate on biased data. Trying to overcome our own handicaps is a common theme in my best short stories, like â€œLong Eyesâ€ and â€œDamned When You Do,â€ and in my Plague Year novels, which begin with a runaway nanotechnology plague that devours all warm-blooded life below 10,000 feet elevation, leaving only a few survivors in the highest mountain peaks. In that storyline, the problems of isolation and limited resources are critical â€” but at least we have hope, imagination, and the memory of something different. In â€œThe Frozen Sky,â€ the natives of Europa have never conceived of the possibility of escaping their world. 4) You’ve become an international bestseller with the Plague Year trilogy. Who is the least known author we should be reading? The truth is I barely read for pleasure any more at all (it’s write, write, write, edit, research, write), which is a crime, because I got into this crazy business because I love to read and grew up as a serious bookworm. Unfortunately, I don’t know of any hidden little gem authors who I should recommend.Â When I do read for pleasure, lately it’s been mostly P.I. and legal thrillers by folks like Robert Crais and John Lescroart, neither of whom is a secret. 5) Â What advice would you give to aspiring fiction writers? The greatest thing about writing is also the worst. Every writer is his own boss. Every writer has to find his own way. There are no short cuts. Do the work. That means learning the craft from the very basics of grammar and sentence structure to developing plot ideas to more advanced nuances like character arcs and subplots. Read a lot. That certainly helps. Study your favorites and the greats. See what works for them, then try to use those tools yourself. For me, when itâ€™s going well, writing is extremely gratifying. Itâ€™s not only similar to playing both sides of a game of chess. Even though Iâ€™m the good guys and the bad guys, Iâ€™m also the board! I build the world. Then I move the players. Anyone whoâ€™s ever enjoyed a great puzzle knows what Iâ€™m talking about. Interested? Read The Frozen Sky, and read Jeff Carlson’s blog. The Frozen Sky is set on Jupiter’s Moon Europa, and reads as kind of a companion to Arthur C. Clarke’s novel 2010: Odyssey Two. Indeed, with some minor changes it could easily take place in the same literary universe as that book. The writing style reminded me of a cross between Arthur C. Clarke’s classic Rendevous with Rama, and the more contemporary Rama II. In other words, anyone who loves classic science fiction will love this 99-cent e-book. What is surprising is how fascinating the story is for anyone familiar with John Boyd — he of fast transients and the air force — will love it too. The speed of observation, orientation [, decision, sometimes], and action is analyzed on multiple levels. A fantastic short-story. Highly recommended. Update: The novella is no longer available. The author has since released a novelization of the short story.